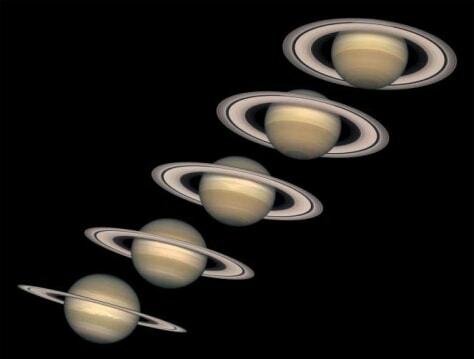 Since Saturn's axis is tilted as it orbits the sun, Saturn has seasons, like those of planet Earth. The Hubble Space Telescope took the above sequence of images about a year apart. Starting on the left in 1996, just after the last time the rings were edge-on, and ending on the right in 2000 when the rings had opened up significantly from our point of view.